The warm weather is upon us so that means a lot of time in the sun. Protecting your skin from UV rays and damage is important. 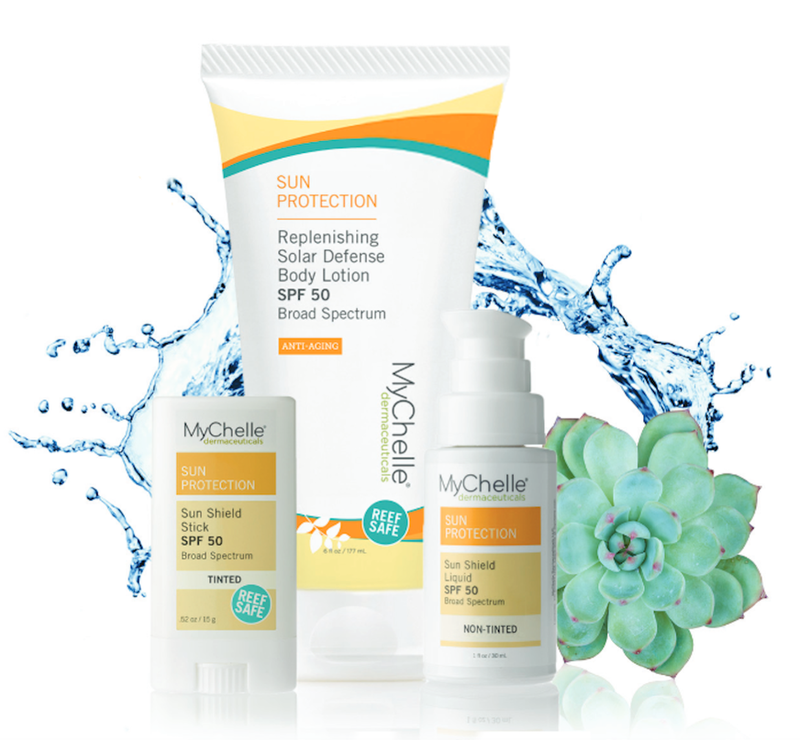 To help you with that, check out my beauty find of the day by MYCHELLE DERMACEUTICALS. When going out in the sun you want to feel protected and comfortable knowing that you can maintain natural, healthy looking skin right? Well I tried the MyChelle products and became a fan. The Replenishing Solar Defense Body Lotion which is water resistant, can be applied with sunscreen to provide extra skin protection while helping to moisturize your skin and prevent damage. The Sun Shield Liquid which is a non-tinted, oil-free formula, can be applied to your skin before you put your make-up on. The weightless liquid, gives you a smooth, matte finish while protection your skin in the sun. The Sun Shield Stick is a mineral based, water resistant sunscreen formula that slides smoothly on to the skin, giving you UVA & UVB protection. The lightly tinted stick moisturizes your skin, with a neutral finish. The mineral, broad spectrum products mentioned here are reef safe, vegetarian and cruelty-free. Also it can be used on all skin types. 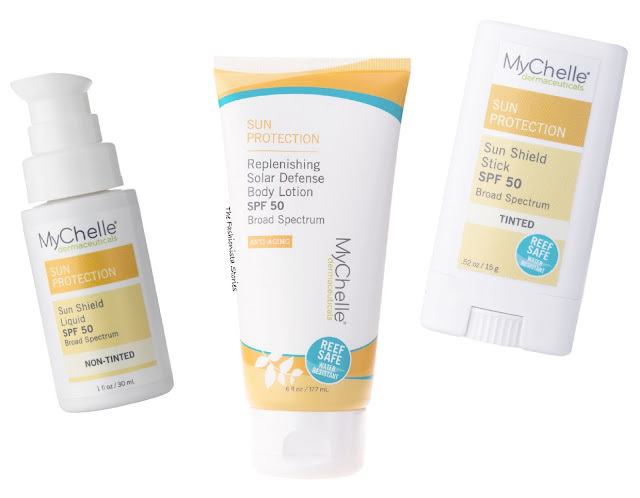 To check out the products & get more info on the brand and more before you try, go to MyChelle.com. 1. Sun Shield Liquid SPF 50 Non-Tinted - A non-tinted, 100% mineral sunscreen for maximum UVA/UVB broad-spectrum protection. This silky, colorless formula blends weightlessly and seamlessly for a wear, matte, finish. Wear alone or use as a sheer primer under foundation to create a smooth, matte finish. Formulated oil-free and recommended for all skin types. SRP $22.50, 1 fl oz. You can purchase the liquid at DERMSTORE & AMAZON. 2. Sun Shield Stick SPF 50 Tinted - This tinted, mineral-based sunscreen provides powerful UVA/UVB broad-spectrum protection and glides on smoothly with just enough color to enhance any skin tone. Avocado, Jojoba and Vitamin E Oils help moisturize and protect skin. Perfect for on the go—it won’t sweat off and has a light natural scent. SRP $12, 0.52 fl oz. You can purchase the stick at DERMSTORE & AMAZON. 3. Replenishing Solar Defense Body Lotion SPF 50 - This 100% mineral-based, hydrating body sun protection melts into skin delivering UVA/UVB broad-spectrum protection without leaving behind any greasy residue. Rich in Coconut Oil and Shea Butter, skin instantly feels nourished and hydrated. SRP $29.50, 6 fl oz. You can purchase the lotion DERMSTORE. Disclosure: I was not financially compensated for this post. I received a sample for review purposes. The opinions are completely my own based on my experience and before you try, you should test the product or consult your dermatologist.